This article is about how to monitor fetal heart tone of early, late, and variable decelerations during labor. I have been studying this in nursing school,and at first I thought this was very hard to understand. So for you I have broken it down by decelerations and simplified the reasons for why it is happening and what it looks like on the fetal heart monitor. I have been studying OB a lot lately mainly because I feel that is my weakest area for the NCLEX and HESI.I find OB super interesting and can’t wait to participate in the whole birthing process myself one day (which will be very far off in the future). It truly is a beautiful process from conception to birth and thereafter. One of the coolest things about the labor process is the monitoring of fetal heart tones. I think it is so neat that technology has advanced in such a way that we can monitor mother’s contractions and the fetal heart tones at the same time and it pops up on a monitor for the nurses/doctors to read. It is used to see how the baby is responding to mom’s contractions and to make sure the baby is getting enough oxygen or isn’t becoming distressed during the labor process. For NCLEX and HESI, I think some of this stuff may be on there so I going to talk about the three main type of fetal heart tones that may be presented on these exams. Plus I find cardiovascular stuff interesting….remember my post on the EKGs lol and this deals with fetal heart tones. However, don’t get it confused with an EKG because the fetal heart tone monitor is just monitoring the heart rate of the baby not the heart rhythm…so don’t be looking for QRS intervals or ST waves on these strips lol. So here we go! After you read this article, be sure to take a Fetal Heart Tone Quiz and test your knowledge on these decelerations. The picture above is known as an “early decelerations”. The top line is monitoring the baby’s heart rate and the bottom line is monitoring mom’s contractions. On the bottom line (mom’s contraction), you can see that the line start to go up and then down…….this means mom is having a contraction. The top line (baby’s heart rate) then responds to this contraction and notice that it slightly dips down while mom is having her contraction. 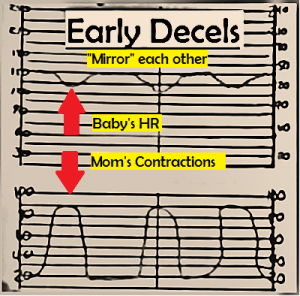 The key to remembering if this an early deceleration is to see if the baby’s heart rate mirrors moms contraction and it does here. Plus look to see if the baby’s heart rate is staying within normal limits of 110-160 beats per minutes. The baby’s heart rate dips slightly at the same time the contraction starts and recovers to a normal range after mom’s contraction is over. Early decelerations are nothing to be alarmed about. The reason the baby’s heart rate starts to slightly decrease is due to head compression (probably from the baby’s head being in the birth canal) causing the vagus nerve to be compressed which in turn decreases the heart rate. So if you see this on NCLEX or HESI the answer to the question will probably be continue to monitor and document the process of the labor or no nursing interventions are required right now but continue to monitor. This crazy looking strip is called “variable decelerations“. I remember it because the dips in the fetal heart tones look like V’s. The v’s remind me that this is a “variable deceleration”. Variable decelerations are NOT good! 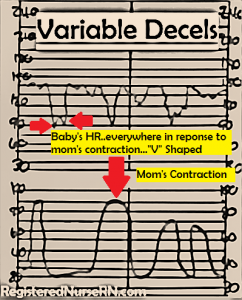 Notice that every time mom has a contraction the baby’s heart rate majorly decreases. Remember a normal fetal heart rate is 110-160 bpms. The cause of the decrease fetal heart rate is due to umbilical cord compression. So if you are presented with this type of strip on NCLEX or HESI some of the answers you would need to pick would be change mom’s position (moving her around could help relieve cord compression), administer Oxygen usually 10 L (because cord is being compressed which in turn is causing the baby to not receive enough Oxygen), stop Picotin infusion if running, and contact the doctor. Plus you may be asked on the exam what is causing this strip to look like this and the answer would be cord compression. The picture above is known as “late decelerations“. The name tells you exactly what should be presented on the strip. Late decelerations are NOT good either just like variable decelerations. Notice that when mom has a contraction the baby’s heart rate goes down long after the beginning of mom’s contraction and recovers way after the contraction is over. 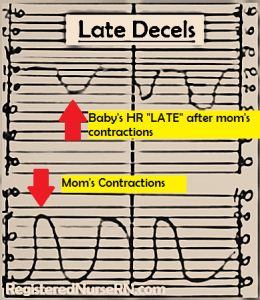 This is different from early decelerations because the baby’s heart rate went down at the same time the contractions happened and recovered to normal when the contraction ended. NCLEX and HESI may ask what is causing this type of strip and the answer would be uteroplacental insufficiency. Some nursing interventions include: turn mom onto her side, stop Picotin if infusing, administer 10 L of O2, maintain IV access, determine the Fetal Heart Rate variability, and contact doctor. By the way, kudos to the OB RNs out there! So there you have it….that was pretty much the down and dirty review of it! Cool huh lol!? I bet this type of monitoring has saved millions of baby’s lives because before this type of monitoring was invented you couldn’t have known if the baby was in distress during the labor. I hope this helps some of you NCLEX and HESI studying students. I was really confused, searched multiple sites, The pictures and explanations here are amazing….THank you So Much, I Finally understand it! Thank you so much 🙂 Glad it helped you out! Actually, studies show no decrease in infant mortality between FHM and intermittent auscultation with a Doppler, but they do show an increase in Caesarean births and other complications with FHM, due to the way it immobilizes a woman during labor and due to inaccurate readings. It is good to understand what the medical staff is reading on the monitor, but this technology does not save lives. Intermittent auscultation is supported by evidence, is what is used to know the baby’s heart rate during labor and delivery without electronic fetal heart monitoring, and it is still a relevant practice. A= accels O= okay, not a problem! Thank you so much for sharing this! VERY helpful and I’m sure other people will find it super helpful. Thanks for your large heart. Good example of what this field is all about, blessing on you and your work. Omo thank you so much for the comment 🙂 It feels good to get these comments. I appreciate it!